Engagement Labs celebrates brand performance leaders. Brands that are included in these awards are highly talked about brands online via social media and offline by consumer word of mouth. The awards are based on the Company’s proprietary TotalSocial® data and analytics, which continuously measures the online and offline social metrics that are proven drivers of business performance. These metrics, including both online and offline conversations against the following major conversation dimensions: net sentiment (the difference in the percent positive conversations minus negative), brand sharing (the extent to which people are sharing or talking about a brand’s marketing or advertising), volume (a measure of how many conversations mention a brand) and influence (the extent to which an influential audience is talking about a brand). 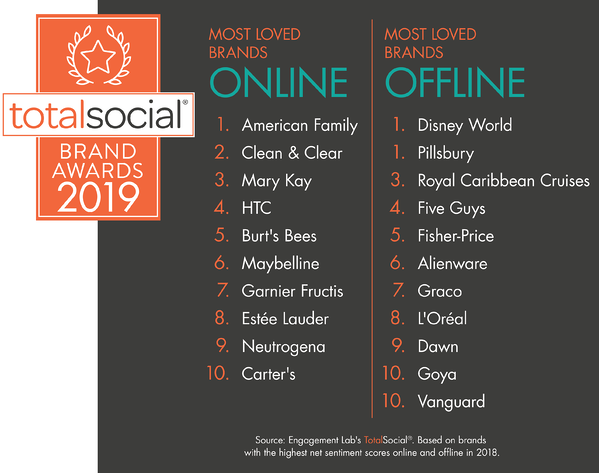 Over the next several months, Engagement Labs will announce awards for the highest scoring brands in each TotalSocial category. Our technology platform, TotalSocial, and the propriety analytical scoring system that drives it, are the basis for these awards. Brand evangelism is the holy grail of brands. Consumers cause their friends and family to buy things when they recommend and talk positively about the brands they love. The Most Loved Award is given to brands with the highest net sentiment scores online and offline in 2018. For the second year in a row, Disney World, promoted as the “Happiest Place on Earth,” tops the list of most loved brands offline and the World’s Best Regarded Companies of 2018. Tied at the number one spot is the iconic Pillsbury brand, that “bakes memories” and kitchen stories with its 49th annual Pillsbury Bake-Off and ugly Christmas sweater hit. While American Family tops the list of most loved brands being talked about during online conversations with its #DreamFearlessly marketing campaign that goes beyond TV commercials, but in real lives. Everyday influencers are the one in 10 consumers with large social networks who frequently make product and service recommendations. The brands that were most successful with everyday influencers are those with the highest online and offline influence scores in 2018. Skype ranked number one in activating everyday influencers offline. The brand, built to connect people, is a vital tool for everyday influencers who prize their networks of people whether they live locally or far away. Skype’s users have spoken and Skype recently redesigned based on customer feedback to get back to it’s roots of a simpler design. 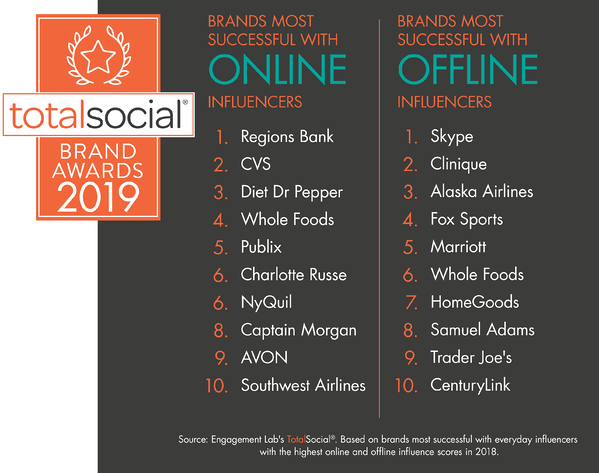 For the second year in a row, Regions Bank holds its position as the number-one brand that engages influencers online. Regions Bank continues to win everyday influencers with its #PiggyPoetry and #MakeADifference campaign by providing grants to non-profits supporting veterans.